Razor clams – facing the fear! Ok so I’m a squeamish Brit but if I dig further into my foodie heart I know that I’ll try most things, but the razor clam hasn’t been on my ‘must try’ list. A couple of years ago I was on the Algarve in Portugal eagerly looking though the lunchtime menus for gems but one restaurant stood out because it served predominately razor clams – fresh from the sea, to my shame I walked on – a step too far for this foodie. Well, I’m now a convert. I first tried them at the Portuguese restaurant Bar Estrela, 111-115 South Lambeth Road, Stockwell, SW8 1UZ. I’d always felt guilty and that I should have given them a go and to be honest was a bit disappointed in my own refusal to try. They were served as tapas so only cost £4 which as a ‘meanie’ I considered enough to lose if we didn’t like them. Once we got over the look of them, we were amazed they tasted like sweet lobster but have the texture of softly cooked squid. Wow! I loved them. Even better news is we can buy them in Walthamstow. The halal butchers and fishmongers shop opposite Sainsbury’s on the High Street usually has a few bunches. I now buy 6 for about £4.50 for a generous starter for 2 people. The first time I dared to buy them I bought a whole bunch and it felt like we were eating them forever, but that wasn’t a problem! In the near future I want to try them chopped up into cubes run through pasta as I think they would work very well as an E17 take on the Italian clam vongole. Wash the clams well in a sink of water, try and give them a gentle squeeze to extract any salt water. Do not add any salt. Put the clams in the base of a large pan, add the wine or ouzo (just a splash) and enough hot water to cover the base of the pan and steam but not boil the clams. Stick a lid on but leave a slight gap and steam the clams for a few minutes until they all open their shells. Have the grill heating up during the time. * The first time I tested my recipe I didn’t add any water just ouzo and put the lid on tight – result was a small heart-attack and flambéed clams! Fish out the opened clams. Remove them from their shells and cut away the gutsy part of them – you’ll see the bits you don’t fancy eating. Lay them back into their shells on the grill pan, cover with lemon juice, chopped chilli, garlic and olive oil. Grill on a high heat for a few minutes until they are looking really tasty – maybe 5 minutes at most. Dress with any remaining chilli and the parsley and a last squeeze of lemon juice. You could add finely sliced spring onions too, in the style of Vietnamese chilli squid. Enjoy! 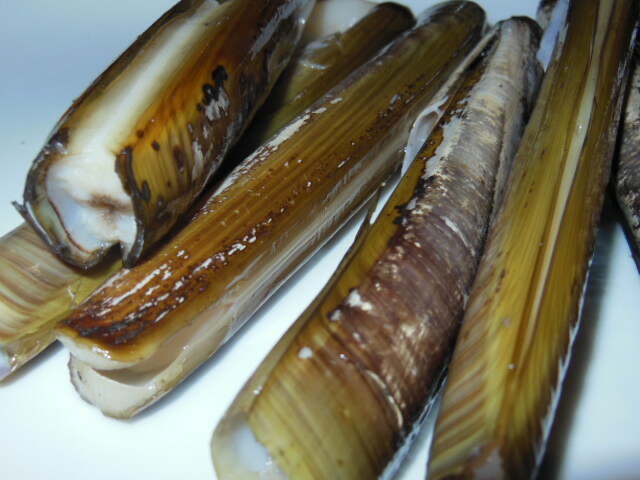 Any foodie ideas what else we can do with razor clams? 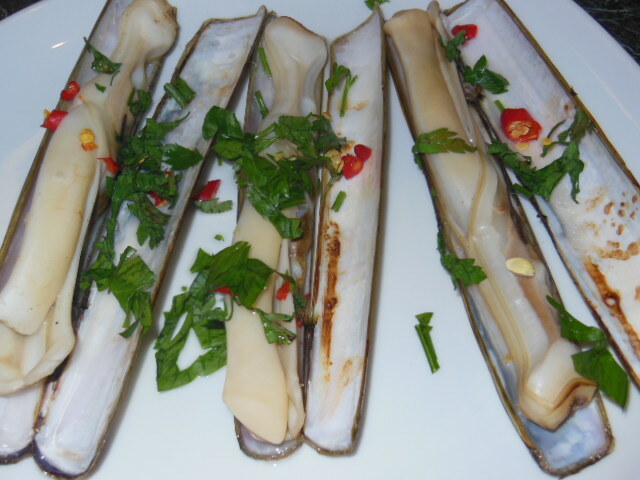 This entry was posted in Recipes and tagged Bar Estrela, Chilli and garlic, Clam, Portugal, Portuguese, Razor clam, starter, Stockwell, Walthamstow. Bookmark the permalink. 5 Responses to Razor clams – facing the fear! Slice and serve as you would clams in spaghetti al vongole – Yum! we are lucky to be able to get them here.